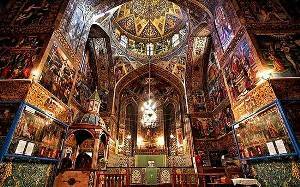 The Holy Savior Cathedral, an Armenian church in Iranian city of Isfahan was included in the International Business Times’ recommendations for British tourists who will from now on be able to travel to the Islamic Republic thanks to direct London-Tehran flights. The Holy Savior Cathedral, commonly known as Vank Cathedral, is an Armenian Apostolic church built in the early 1600s in Isfahan and located in the New Julfa district. The interior is covered with fine frescos and gilded carvings and includes a wainscot of rich tile work. Also included in the list are Mount Damavand, the Bazaar of Isfahan, the Ali Kapu Palace, Isfahan’s Allāhverdi Khan Bridge, Persepolis, Golestan Palace in Tehran, the Zagros Mountains and many other wonders. British Airways resumed direct flights to Iran, running six round trip flights per week with more flights scheduled to be added later this year. Some sanctions against Iran were lifted earlier this year as part of the nuclear deal between Iran and world powers. “Iran is expected to experience a tourism boom. Visitors may be surprised to discover the riches the country has to offer, including ancient ruins, pristine beaches and popular ski resorts. Iran made it on to the top destination lists of major publications thanks to sights that include 2,500-year-old ruins at Persepolis near Shiraz and 16th-century Islamic architectural gems in Isfahan,” IBTimes said.